When someone comes to your website is it clear who you are communicating to? Is it clear who your target audience is? Especially when starting a new business our inclination is to cast our nets wide, trying to be everything to everyone, because we’re afraid of losing out on business. The more the merrier. I would like to challenge you to consider another approach. True, the second you decide to niche your business you are basically choosing to alienate a large segment of potential clients. That can be really scary. Let me ask you this. If you are getting married would you hire a photographer who is a generalist or or a wedding photographer? Would you google “photographer” or “wedding photographer”? My guess is that you would want to use a photographer who specializes in weddings. Someone who has spent thousands of hours photographing weddings. Someone who knows how the day flows and what shots to get. Someone who has been at 100 different weddings and knows just where to look and when. Someone who is experienced in dealing with the raw emotions of a wedding day. As you search for a wedding photographer online, if you land on a website where it is not instantly clear that they specialize in wedding photography would you stay or leave that site? There are lots of ways you can niche down; by audience, industry or specialty. Use your website to focus on a specific segment of consumers that are most likely to connect to your business vs. targeting a broad range of potential customers. It helps to ask yourself not just who you serve best, but also who do you want to "exclude". For example, I only work with clients who have WordPress websites. No Squarespace, no Wix, no Drupal. Why is all this niching stuff important? Once you know your niche, designing your new website suddenly becomes a whole lot easier. When your content is written with your niche in mind, it will instantly resonate with them when they come to your site. The other advantage of niching down is that it is easier to reach and market to your audience. If your audience is Physical Therapists in Seattle that is a whole lot easier to target vs. "small businesses". 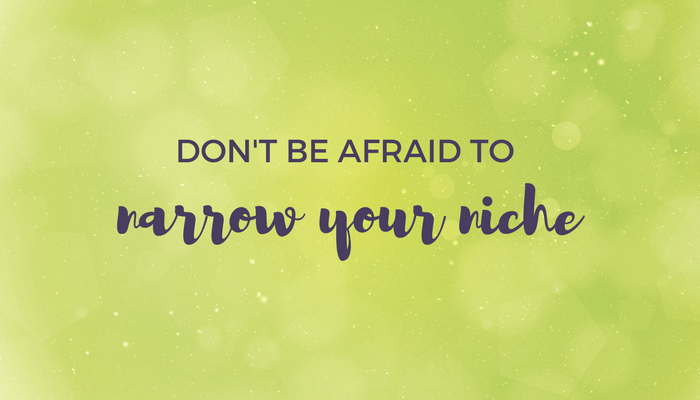 Another thing to keep in mind is that you can start small, and slowly expand your niche once you are well established. A great tip when researching your niche is to think of your niche as an upside-down pyramid, which goes from wide to narrow. With each step get more specific. I suggest you “niche down” five times or five levels. The other helpful tip I heard on Shane Melaugh's The Active Growth Podcast. If you can't rate any of these as a 5, then the niche idea is not worth pursuing.